This is a rather pleasing plant, for the foliage is pretty, though the flowers are too dull in color to be effective. It is almost smooth all over, a foot or more tall, with several spreading stems and rich green leaves, thin in texture and giving out a rather pleasant aromatic smell when crushed. The flowers are less than half an inch long, with a somewhat hairy calyx, covered with dots and becoming inflated in fruit, and a yellowish-white corolla, more or less tinged with purple. This is common in the woods of the Coast Ranges. 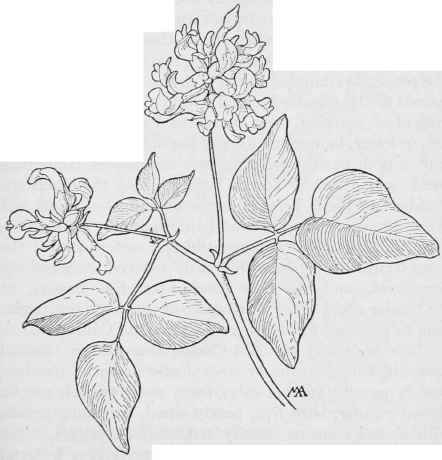 The foliage was used as tea by the early settlers. There are many kinds of Cytisus, natives of Europe, Asia, and Africa, named for Cythrus, one of the Cyclades, where the first species was found. Native California Tea-Psoralea physodes. SENNA FAMILY. Cassiaceae.